Whether or not Sune Agbuke has ever sat down and actually read, "The Road Not Taken," a poem by Robert Frost, she’s certainly lived it. "Two roads diverged in a wood, and I--I took the one less traveled by. And that has made all the difference." The 6-foot-4 senior post chose to come to Baylor and basically sit the bench for two years behind 6-8 All-American post Brittney Griner instead of going somewhere where she could have an immediate impact. "I knew those two years, I'd be doing a lot of sitting, a lot of learning, I'd get beat up a lot," said Agbuke, the lone senior this season on a 33-4 Baylor Lady Bear team that won its fifth consecutive Big 12 regular-season and tournament titles and advanced to the NCAA Tournament Elite Eight. "Those of us like Niya (Johnson), Kristina (Higgins), Chardonae (Fuqua), Alexis (Prince) who came in with that 40-0 team (in 2011-12) that had accomplished so much, really what we learned was mental toughness. And you don't have to be Brittney Griner, you don't have to be Odyssey Sims, you don't have to be Brooklyn Pope. But there are ways you can be effective and ways that you can make a difference." 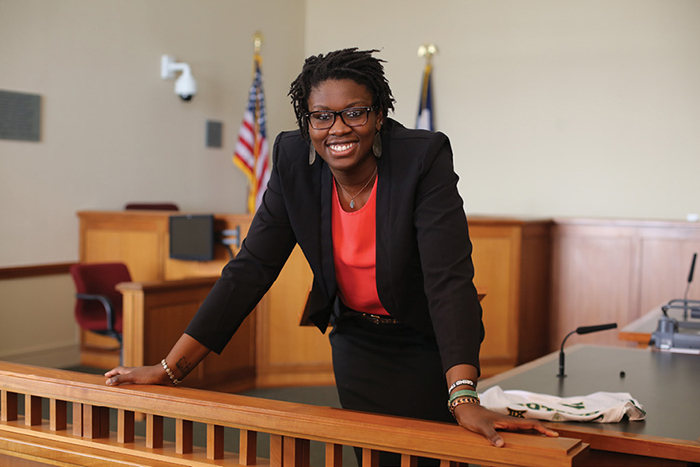 Last May, when Agbuke finished her undergraduate degree in philosophy, she took the road never taken and entered Baylor Law School. "I didn't think it was (crazy) at the time," said Agbuke, who is now in her fourth quarter of her first year of Law School, "and now I'm like, 'Yeah, it's crazy.' The best way I can explain it to my teammates is that it's just like playing basketball for coach (Kim) Mulkey--it's intense and demanding, and you always have to be on your game." 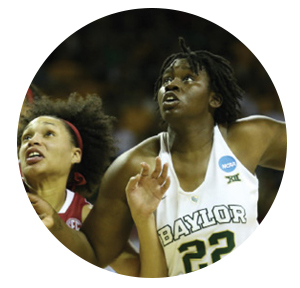 Before Agbuke entered Law School, though, Mulkey gave her the chance to give up basketball and focus on her studies, "because I know how hard it is to be in Law School and try to make the grades and do all that." "I didn't want her coming to me and saying, 'I've got this mass group meeting for Law School and I have to miss practice or be late,' You can't run a program like that," Mulkey added. "So, I gave her the option to just step away. And she didn't want to do it." Mulkey is thanking her lucky stars that Agbuke didn't walk away from it. Despite a slow start because of a knee injury, she averaged 6.1 rebounds and a career-high 6.5 points per game and ranked fourth in the Big 12 with 78 blocks. Saving her best for last, Agbuke registered her first two double-doubles of the season and ninth of her career at the Oklahoma City Regional. She had a career-high 23 points and added 12 rebounds in an 81-66 win over Iowa and followed that up with 12 points and 10 boards in the 77-68 loss to Notre Dame in the final. "You want seniors to go out on a high," Mulkey said. "Obviously, losing is not a high. But if you look at the big picture and what the kid did for her team...Sune Agbuke had a great deal to do with the kind of year we had. She was on the floor. She was a defensive stopper. She altered shots, she helped on dribble penetration. She just had a great senior year." Fighting back tears during the press conference following her final game, Agbuke said, "There's just not another group of girls that I'd want to go to war with." The San Antonio, Texas, native was named to the Big 12 All-Defensive team and a Senior CLASS Award second-team All-American for her achievements in the areas of community, classroom, character and competition. "It just gives you comfort as a coach to look out there and know you have one senior out there that is not afraid," Mulkey said. "Sune just knows how to anticipate things. She knows where to be. She blocks shots. She has good timing....And when our perimeter players get beat off the dribble, Sune's going to be a wall standing there." That delicate balance of books and basketball started at San Antonio Cornerstone Christian, where Agbuke led the Warriors' basketball team to back-to-back state championships and a two-year record of 67-8, played middle blocker on a state runner-up volleyball team and maintained a 4.0 GPA. She picked Baylor over the likes of Miami, Fla., and Oral Roberts, because "it was the total package: amazing academics and athletic programs, a Christ-centered community, and it's close to home." As a freshman that took daily beatings during rebounding drills, Agbuke played a bit part on that 40-0 team that won the 2012 national championship. Playing in 33 games, she averaged 2.2 points, 2.2 rebounds and 7.4 minutes per game. "As time goes by, I just feel blessed," she said. "I realize how hard it is to get to a Final Four. My freshman year, it seemed like it was so easy. Every game, we're just breezing by and you get to the Final Four. Then the next year, we didn't get to the Final Four. And then last year, we got to the Elite Eight. And you really appreciate the work that it takes to get there, like maybe I didn't see that my freshman year." The next year, Agbuke played an even lesser role on a 34-2 team that was upset by Louisville, 82-81, in the Sweet 16. "Looking back on it, I don't know if it was more shocking being down by 19 or losing at the end like that," she said. "Had we won another national championship, it would have been a huge pressure on us. We would have felt like we had some big shoes to fill....I wish we hadn't lost, but I think it helped us realize that we can be just as good. Yeah, we don’t have Brittney Griner. No, we're probably not going to go 40-0. But we can make a run and prove to people that we're still Baylor. And I think we did that." With Griner and four other seniors gone, Agbuke broke into the starting lineup last season and averaged 5.9 points and 7.6 rebounds for a 32-5 team that lost to Notre Dame in the Elite Eight--a step farther than the 2013 team that seemed destined to win another national title. "I'd say reaching the Elite Eight is probably the highlight of my career, even better than winning the national championship," Agbuke said, "because I got to be a bigger part of it. So much of it was unexpected, from the outside. We love to show people that Baylor is much bigger than the Brittney Griners and Sophia Youngs, that we can be a good program without them. Baylor's going to be Baylor when I’m gone." Now that her basketball career is behind her, Agbuke will try to finish Law School in the next couple years and choose a career path between athletic administration and the law that seems to change every time the wind blows. "(Athletics) is what I know; it's what I'm comfortable with," she said, "but my mind changes all the time. Like right now, I'm thinking about criminal law. I really don't know. Either way, I'll be a lawyer."